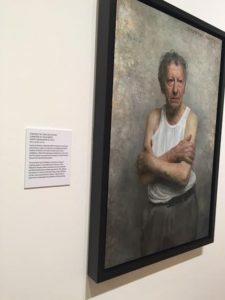 While Mrs Stroke Bloke was sitting an accountancy conversion exam in Belfast, I headed off to the Ulster Museum to see an exhibition of winners and short-listed entries for the 2015 BP Portrait Awards. The Portrait Award is an annual portraiture competition that was originally sponsored by the tobacco company John Player & Sons. 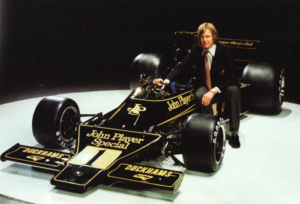 Although JPS once sponsored the coolest looking cars in the history of Formula 1, by the late ’80s they were – for some reason – replaced as sponsor by the much-cuddlier oil company. Now, as viewers of my occasional doodles will know, my skills as a graphic artist tend to the naïve. 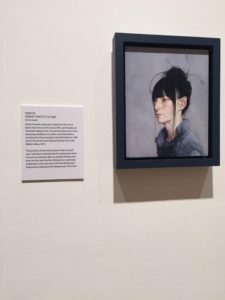 As a result, I found myself a little jealous of the processes described on some of the cards accompanying the Portrait Award exhibits. A full collection of the exhibitors for the 2015 Award exhibition can be found here. The Travel Award Winner for 2014 – whose work was included in the Ulster Museum exhibition – is here. It’s all worth checking out, but here are three pieces in which the conjunction of the painting and the accompanying wurdz was particularly striking. One of the differences between pictorial art and literature is the apparent “ease” with which a painter, for example, can capture a moment. 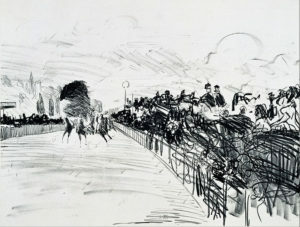 Consider the apparent difference in the degree of difficulty and technique between, say, the efforts of Virginia Woolf and Nicholson Baker, and Édouard Manet’s lithograph of The Races at Longchamp (via the Google Art Project). Light, speed, and movement – is that a horse I see before me? Of course Manet’s picture is made of technique and effort. 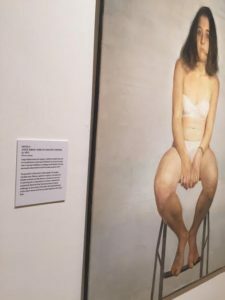 With respect to Parotia, one of the pieces I saw in Belfast, Robert Fawcett says he had been looking forward to painting his partner without make-up. Despite thinking that I knew her face well, the first sittings were surprisingly problematic and it was only in the final sittings that I noticed and understood the idiosyncrasies of her face. Painting can be a very powerful tool. It allows a viewer time to stare and to contemplate the intention of the painting. 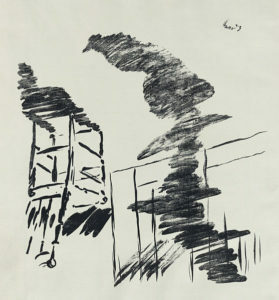 And as Robert Fawcett’s Parotia (above) and Jorge Abbad-Jaime de Aragón Córdoba’s Natalia (below) illustrate, that time is a gift in the hands of the painter as well as the viewer. Being a painter in Spain is not easy, but [my wife] Natalia reminds me that there is a motive to carry on. The opportunity to contemplate and refine, of course, is the gift to the writer. But sometimes, it’s good not to reflect too much, and just slash down the moment.